Ultrasound is more accessible than ever; the utility of ultrasound extends across the entire continuum of care and has become fundamental to providing cost-effective care for patients around the world. Though ultrasound originated within traditional imaging, novel point-of-care applications are now being performed by multiple specialties and are contributing to better patient care pathways that are safer and more economical than traditional imaging. Furthermore, there is a growing body of evidence about the benefits of point-of-care ultrasound and why it should be standard care for many disease states. Jacques Souquet, PhD, founder, executive vice president, and chief strategic and innovation officer of SuperSonic Imagine, notes that in the last three to five years, there's been a big investment in ultrasound productivity. He says he's seeing a lot of new software technology and changes in the way companies are analyzing ultrasound information. "Ultrasound gives clinicians incredible insight—the ability to look into patients' bodies and diagnose, screen, intervene, treat, and monitor," Souquet says. "Still, this is relatively young technology, only a few decades in use. The impact of ultrasound has grown as new users and new uses demonstrate their usefulness in an expanding variety of settings. We're going to see a lot more in the future." Here is a look at what's on the mind of each of the major ultrasound manufacturers. "We are seeing emergency medicine, cardiology, critical care, and anesthesiology departments, among other areas, using point-of-care ultrasound," Mandavia says. "It is likely that this trend will continue. Many medical schools are already training students to use ultrasound. 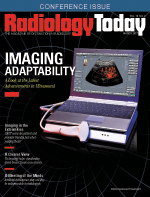 My prediction is that all physicians will utilize highly mobile ultrasound in the future." FUJIFILM SonoSite's products can provide full diagnostic imaging capabilities at the bedside, Mandavia says, adding that fast, high-quality ultrasound examinations at the point of care save lives, increase patient safety, and improve clinician efficiency. For example, the latest model of the Edge II has been enhanced to accelerate image acquisition, enabling clinicians to make more confident decisions and focus on the patient. "There have been continual advances in point-of-care ultrasound technology. This is helping to reduce hospital and patient expenses by decreasing costs to the health system and the time required for diagnosis and treatment," Mandavia says. "Because hand-carried point-of-care systems are so much smaller than conventional cart-based systems—and because mountable point-of-care machines like most of SonoSite's have a 'zero footprint' in locations where space is at a premium—point-of-care ultrasound has also found its way into remote corners of the world where funds, facilities, and space are limited." Vitor Rocha, CEO of Philips Ultrasound, notes that automation, reproducibility, and portability continue to be trends driving ultrasound. Rocha has also noticed a trend of ultrasound expanding to new users and new uses, as more compact devices continue to expand the reach of ultrasound. In addition, there's been a greater commitment to transducer innovations that allow clinicians to easily assess technically difficult patients, such as young children or individuals who are overweight. For example, the Lumify app-based ultrasound system can be plugged into a mobile device. "These portable devices improve the accessibility of ultrasound while streamlining diagnostic processes and improving quality of care for patients," Rocha says. "This has led to wider adoption by a variety of providers who may not traditionally have used ultrasound, including nurses, midwives, and emergency medicine and critical care professionals." "Our customers face increased pressure to reduce costs and improve efficiencies. They look to us for innovative solutions to operate their businesses more effectively," Rocha says. "Just one example of how Philips is addressing this need is through the introduction of OmniSphere, a suite of tools and applications designed to optimize ultrasound operations in hospitals, clinics, and private practices. OmniSphere gives ultrasound managers a clear look into workflow, staffing and equipment utilization, and downtime." Previously focused on just diagnosis, ultrasound is now playing a role across the complete care continuum—for example, screening for cancer, including breast cancer. Currently, GE's Invenia automated breast ultrasound system is the only ultrasound solution FDA approved for dense breast screening; for therapy and guidance, including surgical needle guidance and liver tumor ablation; and for more detailed diagnosis and follow-up care. "It's increasingly useful in diverse clinical settings, and we're proud to be the only ultrasound manufacturer with dedicated development teams by care area," says Neal Sandy, chief marketing and commercial officer of clinical care solutions at GE Healthcare. "We optimize systems designed specifically for these care areas, which means adjusting the size, shape, capabilities, and mobility of our specific offerings to best meet clinical needs." For instance, GE's LOGIQ systems are designed to deliver ultrasound from head to toe, whether a patient is obese or thin, neonate or geriatric. Its latest platform—the LOGIQ E9—combines the resolution and penetration of XDclear technology with innovations to the system's architecture, processing engine, and display technologies. The result is 22% more contrast, 99% improved spatial resolution, and 170% more image information. In fact, in late 2016, GE Healthcare made history with the production and delivery of its 17,000th LOGIQ E9, which is now the most installed premium radiology ultrasound system in history. "We have seen drastic improvements in the quality, cost, and access of ultrasound overall. On quality, we've seen continued and dramatic improvements in image quality—now both 3D and 4D—through both higher resolution and deeper penetration; ease-of-use for caregivers; applications across the care spectrum, including screening, breast care, liver contrast, etc; and digital solutions that immediately transfer diagnostic data into actionable clinical insights that benefit both clinicians and patients," Sandy says. "These advances allow physicians to image blood perfusion and blood flow, view real-time 3D imaging of structures, and differentiate malignant tumors from benign, among other applications," says Joan E. Toth, the company's senior product marketing manager for the Americas. "Another important technological advance in ultrasound, however, is the development of mobile systems with increased functionality for the point-of-care market. Ultrasound mobility doesn't just bring the imaging modality to the bedside in hospitals; it also provides access to the real-time medical images of patients in surgi-centers, offices, and clinics." Compact ultrasound systems, handheld devices, and wireless transducers that are compatible with a phone or tablet have the ability to help clinicians quickly and confidently image internal organs and diagnose abnormalities in soft tissue, unencumbered by cables or bulky cart-based systems, Toth says. She adds that making diagnoses earlier in the care path has real clinical and economic benefits that are essential in today's health care environment, and portable ultrasound has played a key role in making that possible. Konica Minolta Healthcare Americas offers the SONIMAGE HS1 Compact Ultrasound System, which Toth notes delivers a superior image quality and needle visualization required for confident patient care decisions. "[Our] broad frequency linear probes, L18-4 and HL18-4, offer both high sensitivity as well as greater penetration, allowing clinicians to scan both deep and superficial joints and structures," Toth says. "The hockey stick probe reaches difficult to access areas easily with its small footprint and maneuverability." "We've been pushing the envelope to increase the performance of ultrasound imaging to provide improved imaging that benefits from a clinical perspective," he says. The company's ACUSON S3000 Ultrasound System, HELX Evolution with Touch Control, was designed with a dedicated focus on general imaging and IR. "A trend we have been seeing is smaller systems, portable handheld ultrasound, and those that have been finding different uses in point of care," says Paulo Ucio, senior manager of market development for the ultrasound business unit for Toshiba America Medical Systems. "Automation is another trend we are seeing." "The systems are more intelligent than ever before, and that helps users to be more confident," Ucio says. "Ultrasound is very user-dependent, so this is very welcome." "So much has evolved, and our medical curricula are not keeping pace," Rocha says. "In health care, sometimes we get so swept up by the excitement of new features and gadgets that we forget the primary purpose of any imaging solution is to help the clinician better understand what is happening with their patient. That bond is paramount. One of the unique characteristics of ultrasound, separating it from other imaging modalities, is the way in which it allows a clinician to remain present with his or her patient at the bedside, preserving the important human connection so key to effective diagnosis and care."